The Office of Diversity and Multicultural Affairs invites you, your friends and family to the Multicultural Graduates Celebration. 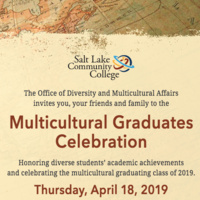 Honoring diverse students’ academic achievements and celebrating the multicultural graduating class of 2019. The Cisco Firewall Specialist provides technical assistance required for VPN client infrastructure. They should offer cost-effective resolutions to the organization. The professional should track device inventory and offer support for the clients.